Eating less, exercising more and losing weight seem the obvious solution for the oncoming 'obesity epidemic'. Rarely, however, is thought given to how these messages are interpreted and whether they are in fact inherently healthy. 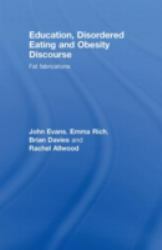 Education, Disordered Eating and Obesity Discourseinvestigates how 'body centred talk' about weight, fat, food and exercise is recycled in schools, enters educational processes, and impacts on the identities and health of young people. Drawing on the experiences of young women who have developed eating disorders and research on international school curricula and the media, the authors challenge the veracity, substance and merits of contemporary 'obesity discourse'. By concentrating on previously unexplored aspects of the debate around weight and health, it is revealed how well-meaning advice can propel some children toward behaviour that seriously damages their health. This book is not only about 'eating disorders' and the people affected, but the effects of obesity discourse on everyone's health as it enters public policy, educational practice and the cultural fabric of our lives. It will interest students, teachers, doctors, health professionals and researchers concerned with obesity and weight issues. ly about 'eating disorders' and the people affected, but the effects of obesity discourse on everyone's health as it enters public policy, educational practice and the cultural fabric of our lives. It will interest students, teachers, doctors, health professionals and researchers concerned with obesity and weight issues.